I breathed fresh air on Wednesday and soaked up some sun on a stunning 85° day. I drove my wheelchair a few blocks, then through the Lowe’s parking lot. (Michael met me there with the van so I could enjoy a little jaunt). We needed a new dryer. Our seven-year-old, irreparable Whirlpool developed an appetite for some of my favorite towels and an expensive throw rug, shredding them to unidentifiable objects. C’est la vie. 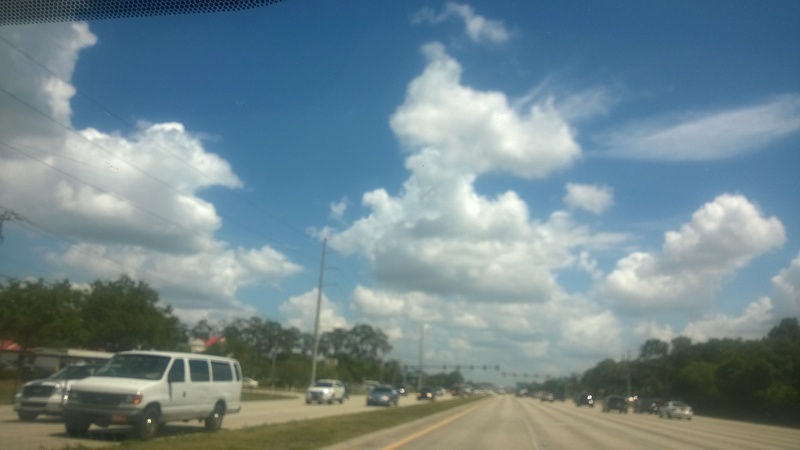 During the drive home (actually only across the street from our condo), I was swept away by these stunning white puffs floating in a crystal blue sky.How luxurious!